Rent our beach house in Mystic, CT and enjoy your summer vacation by the shore in this vacation house rental near the Mystic Seaport, Aquarium, Stonington, and the other Mystic attractions. 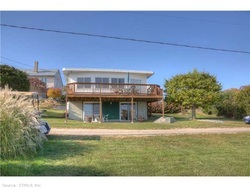 This house is a 3 bedroom 2 bath home that comfortably sleeps 6 people and is located in Latimer Point, a unique private waterfront community, that has 2 private beaches, playground, picnic and boating areas. Latimer Point is perfectly located less than 5 miles from Downtown Mystic, the Mystic Seaport, the Mystic Aquarium and other Mystic attractions. Experience the summer festivals, special exhibits and waterfront activities while enjoying all that a Connecticut shore vacation has to offer. Relax on the front deck and enjoy waterviews of Stonington Borough, Fishers Island Sound, Latimer Lighthouse and Fishers Island. There are two beaches each within blocks of the beach house. 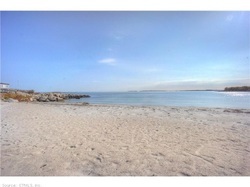 The larger beach is perfect for swimming, soaking up the sun and building sandcastles. Find snails and hermit crabs while splashing in the calm waters at the smaller beach. The playground with its swing set and slides also has a large green area that encourages family ball games. Our streets are private and pedestrian friendly. Walk or bike around the Point and enjoy the waterviews from every area. We prefer to answer any questions by email in order to avoid any confusion. Please use the contact form in the "Contact Us" tab or email us at beachspot@hotmail.com Our phone contact is (860)449-3189.